Efforts to assure aerodynamic efficiency ultimately consider the forces of lift and drag. In an airplane, lift comes from the airfoil shape of its wings, which force faster moving air to flow above, lessening air pressure, and facilitating upward movement. Helicopter rotors use a similar curved design to produce lift. The resistant force to lift is drag. It impedes velocity, increases fuel consumption and can jeopardize safety. Drag relies on the chaotic property changes in airflow caused by physical disturbances along what should be a flat, waxed, solid surface. Surface deterioration has numerous causes. While oxidation occurs naturally, it can easily turn corrosive with the introduction of fluid to pit and fret the surface. Abrasion via scratches, dents, and pings will exacerbate surface irregularities. Perhaps one of the most confounding causes of drag is bug residue. While small in mass, accumulating insects on aircraft wings disrupt the smooth, laminar flow of air noticeably degrading aerodynamic performance. Bugs are ubiquitous. Regardless of location, time of year, or temperate zone, they are impossible to avoid at lower altitudes. 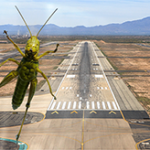 When an insect explodes against the aircraft surface its exoskeleton cracks open releasing tacky blood or hemolymph. What’s left sticking to the surface is a splatter of sugars, fats, and proteins. The messy splatter collected at takeoff will remain in place and harden throughout the flight making it increasingly difficult to remove. Bug guts are acidic, and left to decay, they will attract bacteria and form a stronger bond with underlying surfaces. Scientists and engineers have studied splatter patterns in efforts to develop coatings to minimize protein adhesion. But the leading edge of an airplane wing or a helicopter’s rotor blades are challenging to protect. NUVITE Chemical Compounds offers numerous solutions to address parasitic deposits. In addition to being perfect for touch-ups in between maintenance polishes, NuImage Cleaner & Debugger for bare metal, is a powerful liquefier for baked-on insects. 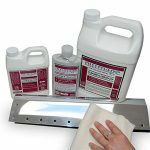 For painted surfaces, CitriCut Concentrate and SS9-3 cover light to heavy-duty bug removal with great efficiency.